The index opened flat and stayed in a narrow range but saw huge buying interest in the second half to close strong at 8270.45, gain of 66.75 points. The broader market though was weak with 618 advances to 954 declines. Range for the series still at 8000-8400. 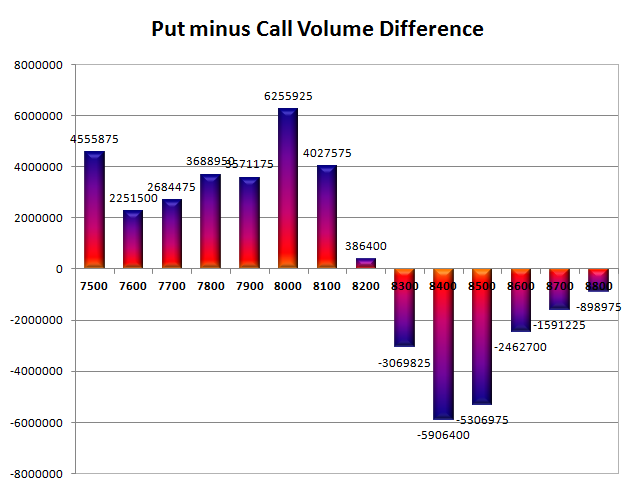 Call option 8400-8800 added 20.47 lacs OI with short covering at 8300 and below strike prices. Put option 8400-7500 added 36.41 lacs OI with profit booking at 8000 strike price. 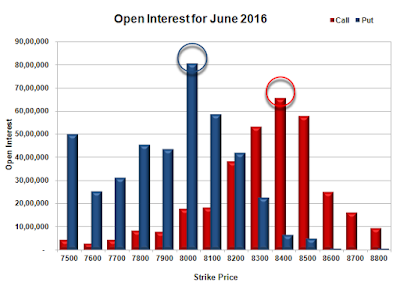 Nifty Open Interest is at 1,58,88,150 up by 3,27,450, with increase in price, probably long build-up. 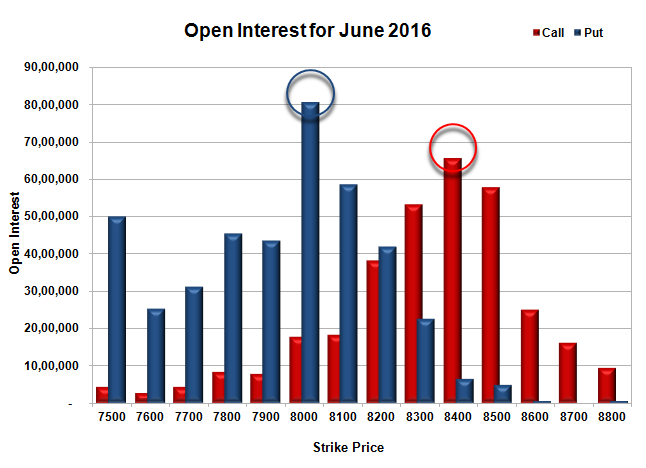 Bank Nifty Open Interest is at 18,25,410 up by 24,630 with increase in price, probably long build-up. FII’s bought 4816 contracts of Index Futures, which includes net 6030 contracts long build-up and 1214 contracts short build-up, with increase in net OI by 7244 contracts, includes 37493 longs to 32677 shorts for the day. 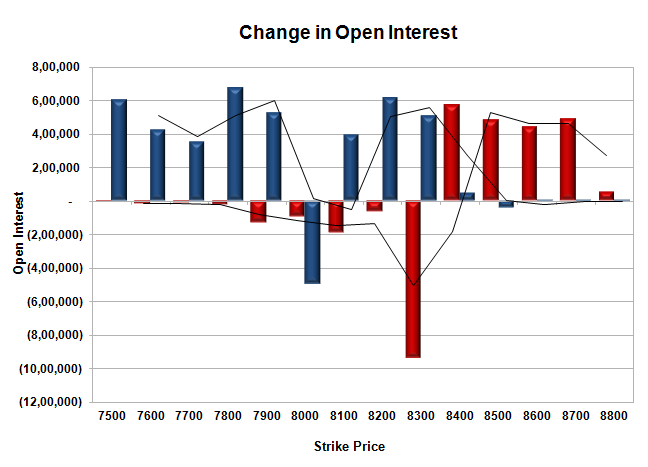 FII’s Index future open contract as on date is 176951 Longs to 58191 Shorts, Net long 118760 contracts. 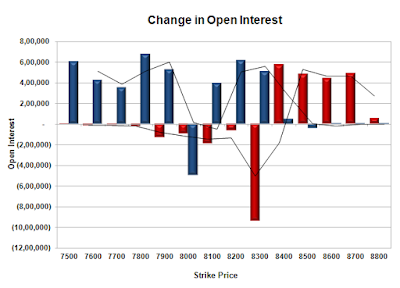 Initial support stays at 8200, with OI of 42.08 lacs and below that at 8100 with OI of 58.73 lacs. Initial resistance at 8300, with OI of 53.28 lacs and above that at 8400 with OI of 65.54 lacs. Day Range as per Option Table is 8188 - 8317 and as per VIX is 8192 - 8348 with 8248 as the Pivot.